If you’re still using a password to login to your AWS account it’s time you batten down the hatches. With a little work you can dramatically improve security. First get ahold of the aws comand line tools. They’re python based so you’ll need the package manager “pip” first. You don’t want to be using your aws root user for everything. So we’ll create a new user called “seancli”. 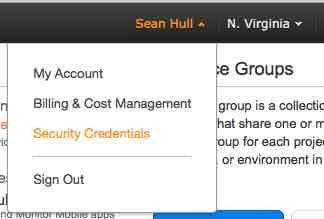 $ aws create-user --user-name "seancli"
$ aws iam create-login-profile --user-name "seancli" --password "seanpass"
We want our new user to be able to administer things. So let’s give him administrator privileges to AWS resources. AdministratorAccess is a collection of permissions & a policy managed by AWS. Now for the fun bit. Enable multi-factor authentication. 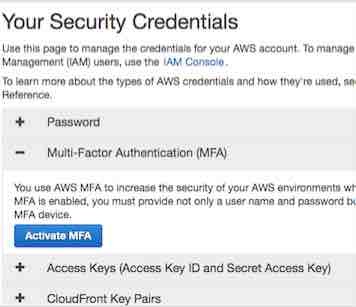 This is important for really making your aws account secure. Remember anyone who gets into your account can delete *ALL* your infrastructure, and/or spinup servers which cost a lot of money. So just a password alone is not sufficient. MFA uses your phone (or a key fob if you like) as the second factor. H. Point your smartphone camera at the QR code from step E.
You’ll be asked to enter *two* consecutive six-digit sequences. Once completed, try logging in again. After you’ve created your new user, you should test it to make sure you can login properly. Does FedRAMP formalize what good devops already do? Does Linux tell the Gilgamesh story of hacker culture? Previous PostPrevious Is AWS enabling AngelList to boil the VC business?